Pakistan's Army Chief Key To U.S. Plans In Region Within the next few weeks, the Obama administration will unveil its new strategy — and goals — for Pakistan and Afghanistan. One of the central figures in that strategy is Pakistan's army chief of staff, Gen. Ashfaq Kayani, who has been meeting with U.S. officials this week in Washington. 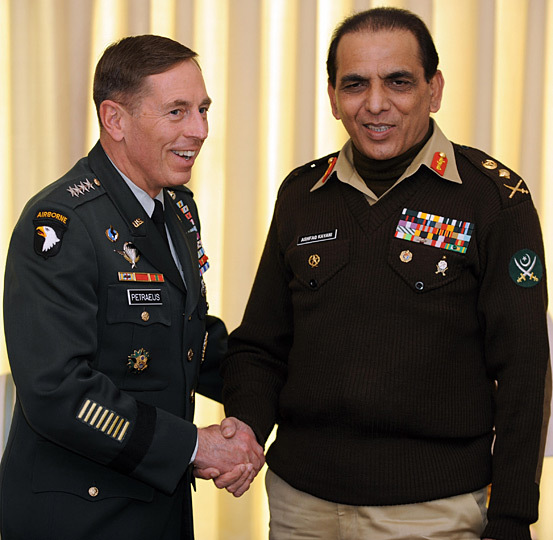 Pakistani army chief of staff Gen. Ashfaq Kayani (right) with U.S. Gen. David Petraeus in Islamabad last month. Within the next few weeks, the Obama administration will unveil its new strategy — and goals — for Pakistan and Afghanistan. One of the central figures in that strategy is Pakistan's army chief of staff, Gen. Ashfaq Kayani, who has been meeting with U.S. officials this week in Washington. When Kayani became chief of staff just over a year ago, there was a collective sigh of relief both in Pakistan and in the United States. Kayani replaced Gen. Pervez Musharraf, who also served as president. Musharraf stepped down under pressure and in disgrace after eight years of rule. Kayani was quickly met with high praise from U.S. officials. The chain-smoking, stern-faced general is eloquent, enjoys a round of golf and studied at the U.S. Army Command and General Staff College at Fort Leavenworth, Kan.
"I think the United States went a little overboard in trying to project him as Western-oriented, Western-educated, Western-trained," says Shuja Nawaz of the Atlantic Council. Nawaz, the author of Crossed Sword: Pakistan, Its Army and the Wars Within, is one of few people who have interviewed Kayani. He says that even though the general is seen as liking the United States, Kayani's primary loyalties lie with Pakistan. "The reality of the situation is, in Pakistan, that the army chief decides what's in the army and the country's national interest, and not necessarily in the interest of partner nations, even if they are such major superpowers as the United States," Nawaz says. When Kayani took control of the 600,000-strong army, he essentially became the most powerful man in Pakistan. The army controls foreign policy and much of the economy, and it was the army that decided Pakistan would become a nuclear-armed state. Kayani also has been head of Pakistan's powerful intelligence agency, the ISI, which has had long links to the Taliban. Pakistani author and journalist Ahmed Rashid says that during that time, Kayani worked closely with senior CIA and Pentagon officials. "So he knows a great deal of the whole covert war — where all the bodies are buried, as it were, what the extent of the relationship with not just the American military but with the American CIA has been and is right now," he says. As far as the war on terrorism is concerned, Kayani is "very, very much on the ball," Rashid says. Relations with Pakistan's military, and certainly with its army chief, are critical to U.S. national security concerns because of a resurgence of the Taliban and al-Qaida along Pakistan's border with Afghanistan. The United States has been pushing Pakistan hard to take on the Islamist militants. Seth Jones of the Rand Corporation says Pakistan has launched offensives in some regions and has coordinated with the United States in dozens of missile strikes from unmanned drones. But, he says, Pakistan is reluctant to take on some militant groups. "Pakistan is primarily interested, as one might expect, in targeting groups that threaten the Pakistani state. The United States is interested in targeting groups that threaten the Afghan state," Jones says. "There is overlap in some of these areas, but there aren't in others." Jones says that while that has been a common point of friction between the U.S. and Pakistan, there are clear and increasing strategic overlaps between the two countries. That includes allowing the United States to train the paramilitary Frontier Corps in counterinsurgency techniques. The U.S. wants this training broadly extended to Pakistan's regular army. And it may have some leverage when Kayani meets with Pentagon and administration officials this week to ask for helicopters, drones and other equipment, Rashid says. "Gen. Kayani will be carrying a big shopping list for the Pakistan army that he wants from the Americans," Rashid says. The United States, Rashid says, is likely to say they'll be happy to oblige, "'but we'd like you once again to commit a regular number of troops to be trained in counterinsurgency so that American equipment can be used most effectively.'" But Kayani has to be careful to be seen in Pakistan — where anti-Americanism is rife — as striking the right balance between helping fight Islamist extremism but not bowing to U.S. pressure, says Anthony Cordesman of the Center for Strategic and International Studies. "The minute we create the image that any figure is not serving the interests of his own country and his own people, we fatally undercut that person ... and we also undercut our own interests by basically weakening the people we need most," Cordesman says. Nonetheless, Kayani is being given a warm reception during his trip to the United States, which includes a return visit to Fort Leavenworth, where he studied as a young major. The topic of his thesis was "Strengths and Weaknesses of the Afghan Resistance."